In very good overall condition (some wear to grip), a superb 1845 pattern senior British infantry officer's sword, etched to Col A. S. H. Lowe. Relatively un researched, we know Colonel Lowe served in Egypt but not much else. 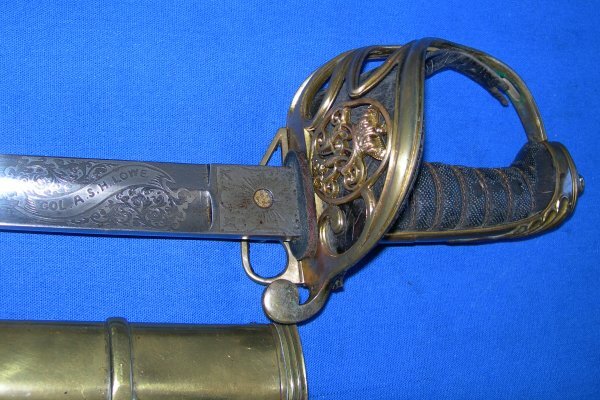 This gilt on brass gothic hilted sword has the folding guard and fullered blade that makes it an 1845 pattern (as opposed to an 1822 or 1854 pattern). The blade clearly etched "Col A. S. H. Lowe". Includes original black leather hilt liner; a real bonus! The 32 1/2 inch blade is very well etched, the etching still crisp and clear, the blade firm in the hilt. 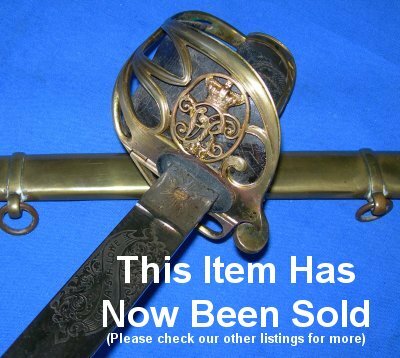 The gilt hilt is in very good condition for its age, no damage, folding section working well. The fishskin grip and associated twisted grip wire bindings are also very good, though the fishskin is worn around / under the pommel area one side especially, commensurate with being held a lot (held while sheathed most likely). 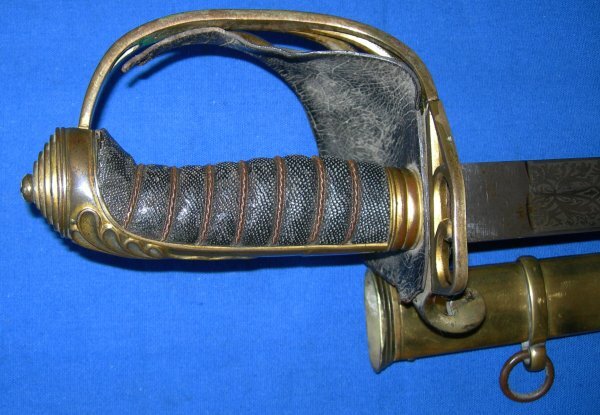 The brass scabbard for more senior officers is good but with some dings and slight damage as you should expect. The sword sheathes and draws well if a little loosely. This is a well above average example and worth our price even without the original officer owner's details etched on the blade. Please quote item reference I59 (1065). Further / full sized images are available upon request.